The Beehive in Acadia National Park juts out of the surrounding terrain proudly at 520 feet (158 m). If you have ever visited Sand Beach, you likely noticed it to the northwest, towering over the tree tops. You would have driven by it on the right just before arriving at the Sand Beach parking area from Bar Harbor. Even without binoculars, you will often see hikers trekking up the southeastern face. The trail is designated as strenuous as it has steep grades and many steady climbs. (See Acadia Hiking Trails & Walking Paths) The trail entrance is between the Entrance Fee Station on the Park Loop Road and Sand Beach, on the eastern shore of Mount Desert Island. The first picture of The Beehive Mountain you see at the top of this page shows a perspective that many visitors do not get to see. The view is one that is readibly available, but is found at the far end or eastern end of Sand Beach. I love it early in the morning just as the sun peeks over the hill on the right which is part of Great Head. There are some stone steps at the base of the hill which lead up to the Great Head Trail which offers even more spectacular views of The Beehive, and of course, Sand Beach. Check out Places to Stay - Lodging Options. 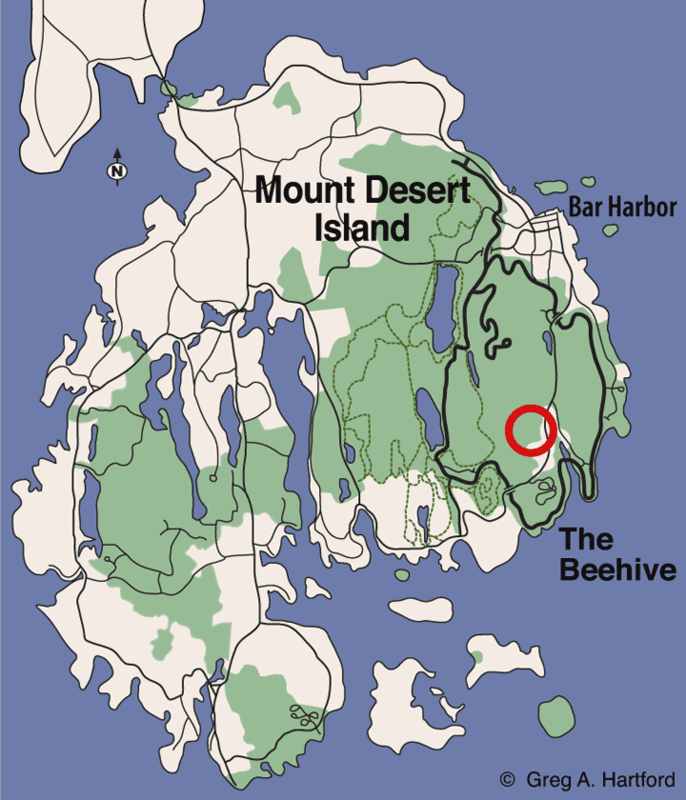 The Beehive Mountain is at the center of a very popular spot within Acadia National Park which, essentially, revolves are Sand Beach. As you are driving south on the Park Loop Road after the Park Entrance Station, The Beehive is on the right just before arriving at the Sand Beach parking area. When you park here, and get out of your car, you will see The Beehive towering overhead on the northwestern side. The best views of The Beehive once you get onto the beach are found at the far end of the beach, or from the Great head Trail.